A few weeks ago, I commemorated the 50th anniversary of Raymond Chandler’s death by mixing myself a gimlet and reading passages from The Long Goodbye (1953). Gimlets weren’t in the first draft of The Long Goodbye. In 1952, as Chandler was revising the novel to prepare it for publication, he and Cissy took a monthlong trip to London. He discovered gimlets on their return voyage aboard the RMS Mauretania. He liked them so much that he worked them into the final version of the novel. READ MORE: “Writing The Long Goodbye,” by Mark Coggins; “Detectives & Their Drinks: Cocktail Recipies & Thin Man Martini,” by Janet Rudolph (Mystery Fanfare). That was fun, thanks. I'm going to go make a proper gimlet. Can't recall the last time I had a gimlet, probably because I didn't stop at one. I think it's time I renewed my acquaintance. Perfect. Like Chandler--sweet, sour, and melancholic. But beware of US-made Rose's Lime Juice; it's made with high fructose corn syrup (with its accompanying icky mouth feel and aftertaste). 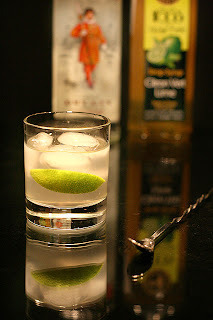 To create a gimlet that Chandler and Marlowe would recognize buy (or order online) Rose's Lime Cordial from Canada where it is still made with sugar. Yes, perfect on a hot day. Didn't Chandler drink stingers before embarking on finishing The Blue Dahlia? He seems to have liked sweet cocktails. Im 22 but ordered one at a maine bar and my gf's dad was like "my mother drinks those (80)"
Thanks to Raymond Chandler, gimlets have been my preferred cocktail since I first began imbibing nearly forty years ago. I prefer mine be made with tequila, but would happily accept one made with vodka or gin, especially when toasting Chandler's memory.